It’s our last day in the country so we had our café con leche (caliente) at the little coffee shoppe in our neighbourhood before saying goodbye to València’s Old Town and going our separate ways to do our usual last goodbyes. Every person has a tradition, and while mine is to spend a last day offering thanks to my favourite spots, today was a little different since one of the spots to which I had wanted to go, I had not found the time until now. My intention was to spend my afternoon at the Museu de les Ciències Príncipe Felipe (the science museum) until. Until. Until I found a park of a man. 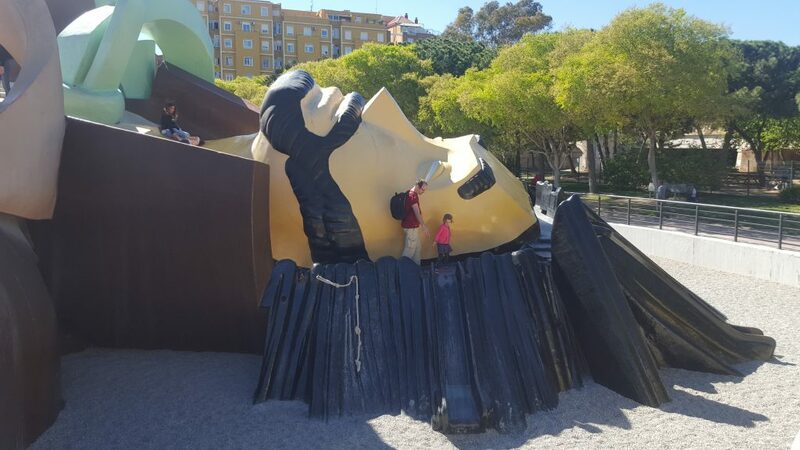 A literal massive park, the structure of which was an entire man, laid out on the ground. It was huge, and covered in slides, stairs, caves, and ropes. It was also covered in children, while most parents where sat along the side watching. 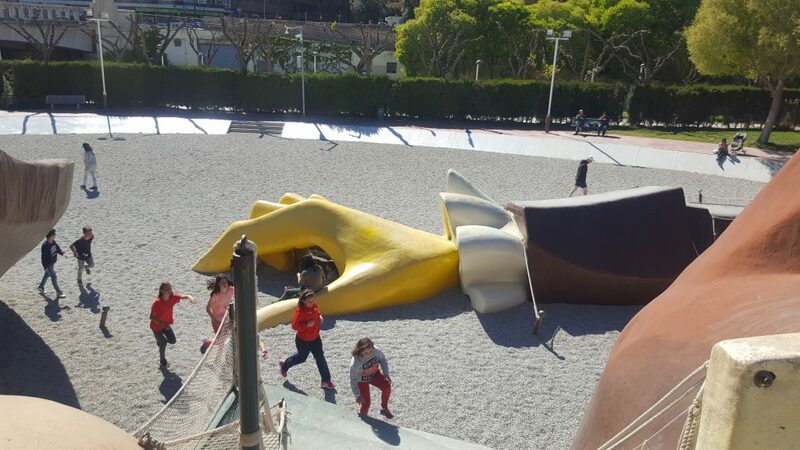 Except for the parents with far too small infants to be left alone, or those who just threw their children onto Gulliver (the name of the man over which one climbs and slides, as in Gulliver’s Travels, I presume) or the parents right up my alley who wanted to enjoy the situation themselves. The Brits had my back, and my clean pants. 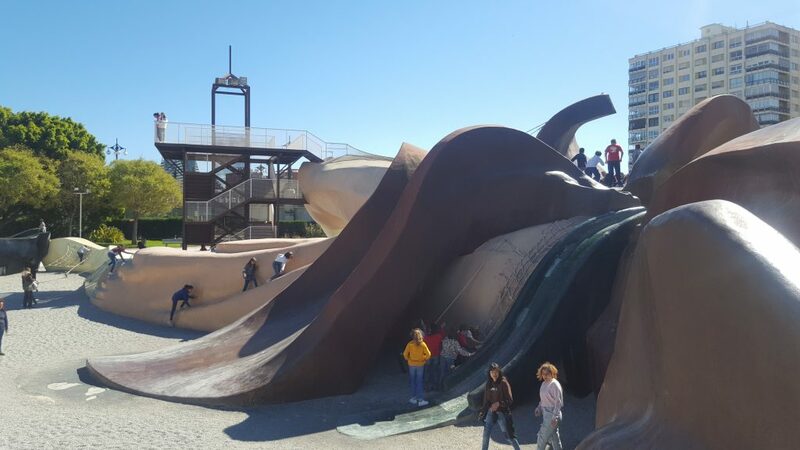 Thanks to all of the children keeping the slides clean with their own pants. I did finally make my way to the science museum, but without enough time to go inside, and so I spent a couple of hours in the sunshine enjoying the incredible architecture of the place. I’ve never seen anything like it, and am surprised that it has not to date been used as a set for some kind of futuristic film setting. See my photos over this way, and enjoy a little history and information on the site right this way. València, you’ve been an absolute dream. Thank you. Tomorrow we head to The Country of Beautiful Men – Portugal. I have been telling Azza about this since we booked our trip. After confirming our apartment, my host gave me his girlfriend’s brother’s number, since he is the one meeting us to give us our keys. I added him and went to message him on WhatsApp. Which is when I saw his photo, serving as Azza’s first foray into the men of Portugal. I would post his photo, but that feels like a violation of sorts; rather, trust me when both Azza and me communicate to you WOW. His name is Joāo. We don’t have a clue how to pronounce it, but have opted to call him Hwow, though fully aware that the Portugese don’t pronounce their ‘j’ like the Spanish ‘j’. 2. The bicycle and scooter lanes all over València. They are a part of the normal sidewalk, but clearly marked in a different colour, with two lanes one as coming, the other as going. Everyone respects their use, and as a woman who is loathe to cycle on the actual road alongside cars, I would love for these to be all over Canada, as well. 3. The cost of food in this country. The grocery stores only carry what’s in season, and what’s local. Which makes everything super cheap and supports their own economy. Everything also tastes distinctly better, like their tomatoes that taste like they’re dipped in sugar and which I am biting into like an apple on the daily. As with the bicycle / scooter lanes, Canada could use to learn from Spain on this equally important point.